Will HP Beat Apple and Google to Streaming Music? Google Music! iTunes Live! While rumors have ebbed and flowed about streaming music from Cupertino and Mountain View for well over a year now, is it possible that HP is going to beat both to the punch? According to that slide, the TouchPad will come with a music syncing solution built-in that utilizes cloud servers to sync and remotely store your music. More than that, it will leverage a "smart algorithm" to ensure that the music the user is most likely to listen to is cached locally on the device. 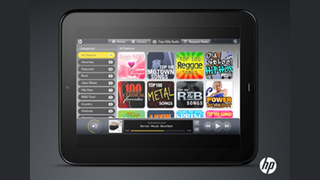 This service will also allow TouchPad owners to stream music that they don't yet own. No word on when all of this would go into effect, if at all, but presumably HP's got its record label ducks in a row if they're flogging it as a TouchPad feature. Or they're going the Amazon route of not dealing with the labels at all, then letting the lawyers sort it out.